and here he is....looking rather cool methinks. So do pop over to Funky Kits...the home of Sugar Nellie...and check out all the gorgeous stamps and digi's...you will be spoilt for choice..
Gorgeous "Boy" card, go to make one myself in a mo! 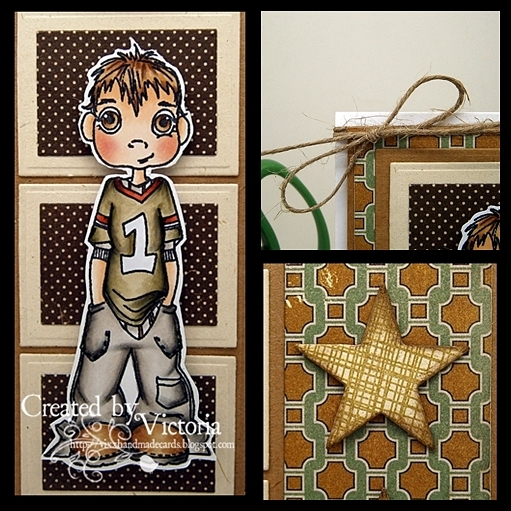 Love the stars and the craft cardstock. What a gorgeous card Vicky. Super card for the lads Vicky. Sorry to be a bad visitor lately, too much to do and not enough time. What a stunner Vicky - amazing colouring and I love the LO. Fantastic male card Vicky, and I love those Authentique papers,my favourite for boys..fabulous colouring and love the design. Hi Vicky this is a fab boys card! Love this card, fab image and great layout. another great card Vicky,plain, simple and just right for the awkward teenager. This is a fabulous male card Vicky! Great character and gorgeous layout!